Gaetano Donizetti is often regarded as the living bridge between the two operatic eras exemplified by Rossini and Verdi. He combines a mastery of bel canto with a keen sense of emotionality, both comedic and dramatic. Patrons of the Vienna State Opera have a chance to see one of Donizetti's tragic masterpieces this season, the memorable and inimitable Lucia di Lammermoor. 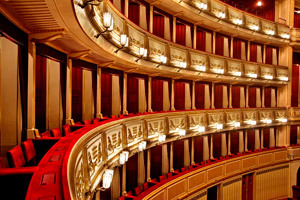 The opera was composed in record time due to Donizetti's contract with Naples' Royal Theatres. The composer commissioned the services of librettist Salvatore Cammarano, who turned to Sir Walter Scott's classic melodrama The Bride of Lammermoor and from it built one of opera's most contrived and unbelievable plots. Lucia and Edgardo are lovers from two opposing Scottish noble families. Lucia's brother Enrico leads her to believe Edgardo has been unfaithful and pushes her into marriage with Arturo. The young woman is so devastated by the alleged betrayal that she starts to lose her mind, which unleashes a series of murders and suicides that take melodrama to a whole new level. While the plot borders on the ridiculous with its over-the-top dramatic antics, Donizetti's full-blooded, inspired, and intense score lifts the whole opera up. Naturally, the premiere at the Teatro di San Carlo in Naples on 26 September 1835 made the work an instant classic. Due to the time pressure, Donizetti composed with the San Carlo cast's abilities in mind. He crafted the role of Lucia especially for Fanny Tacchinardi Persiani, a highly technical soprano whose otherworldly vocal performances, especially during the famous 'Mad Scene' where her character descends into insanity, helped cement the opera's reputation. This pivotal scene also demonstrates Donizetti's mastery of musical characterisation: many of Lucia's melody lines are quotations from earlier acts, which the composer purposefully mangles to convey the character's mental breakdown. The result is impactful and eerie. Aside from dramatic solo spots, Donizetti also penned powerful ensemble numbers such as the sextet 'Chi mi frena in tal momento', which lets the unbridled emotional conflicts within the Lammermoor family ignite. The rapidity, talent, and inspiration that Gaetano Donizetti put in elevating Scott's melodramatic Bride of Lammermoor into one of opera's classic tragedies remain amazing to this day. This operatic wonder now comes to life on the stage of the Wiener Staatsoper.